Updated classic. 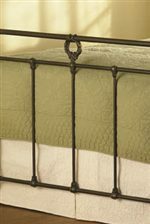 Inspired by late 19th century brass beds of England, the Wellington Bed enhances old-world charm with its detailed center castings, fluid curves, and smoothed edges . Personalize it by choosing from more than 40 different finishes. Is Available in double, queen or king size. The Wellington Iron Headboard and Footboard Bed at Morris Home in the Dayton, Cincinnati, Columbus, Ohio, Northern Kentucky area. Product availability may vary. Contact us for the most current availability on this product. Finish & Paint Options Available in over 45 finishes, each individually electrostatically applied by specially trained colorists. Each item is also baked in high temperature specialty ovens, which produces a rich PowerBond finish of superior durability. Warranty Limited lifetime warranty on all beds. Updated classic. Inspired by late 19th century brass beds of England, the Wellington Collection enhances old-world charm through detailed center castings, fluid curves, and smoothed edges . Available in multiple configurations and in over 45+ individualized finishes, the Wellington Collection rewards creativity through personalization. With every bed frame constructed of premium high gauge steel, it is designed and manufactured to ensure durability and strength. The Wellington collection is a great option if you are looking for Casual furniture in the Dayton, Cincinnati, Columbus, Ohio, Northern Kentucky area.